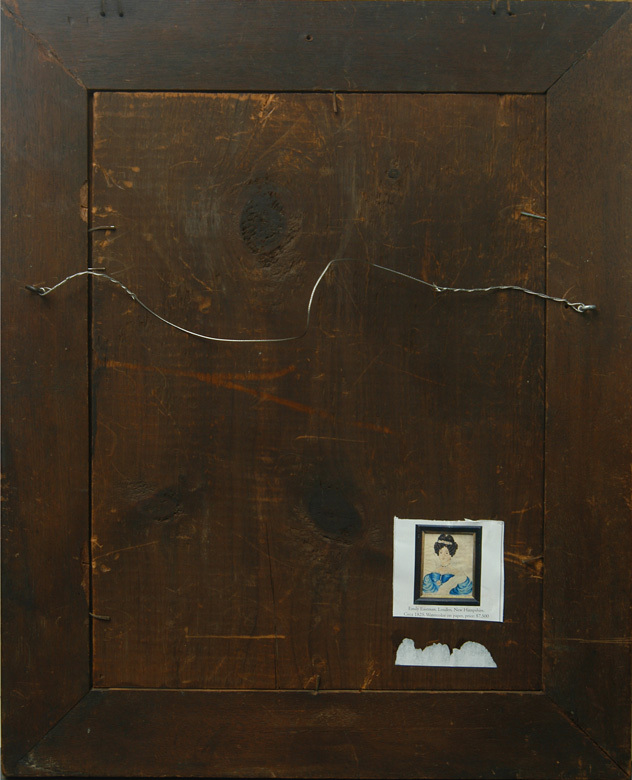 Emily Eastman’s work represents the best of early 19th century American folk art. She worked in watercolors and graphite on paper or Bristol board. Her paintings are delightfully naïve, mostly representing stylishly dressed young women with carefully delineated details such as jewelry, lace, hair curls and hair adornments. 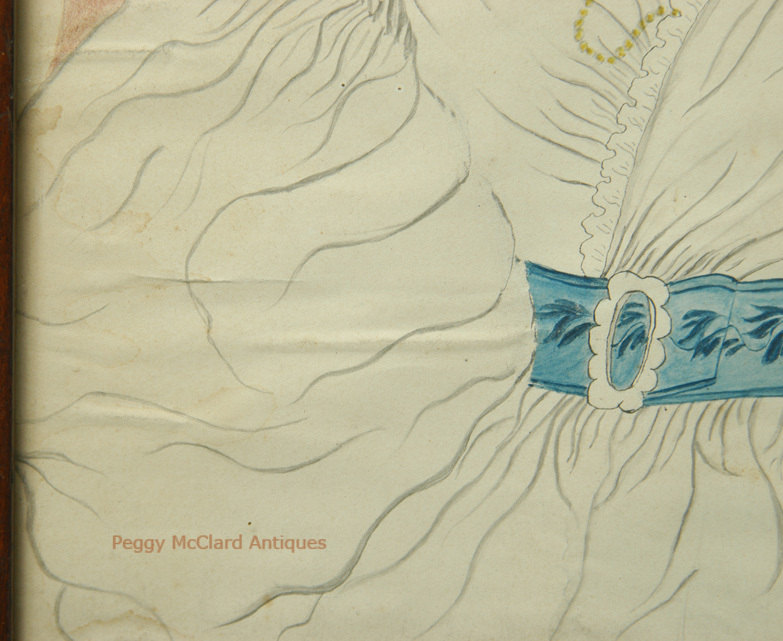 It has long been thought that Eastman’s work was based on fashion plates of the time period, although no specific prints have been identified as the foundation for her work. 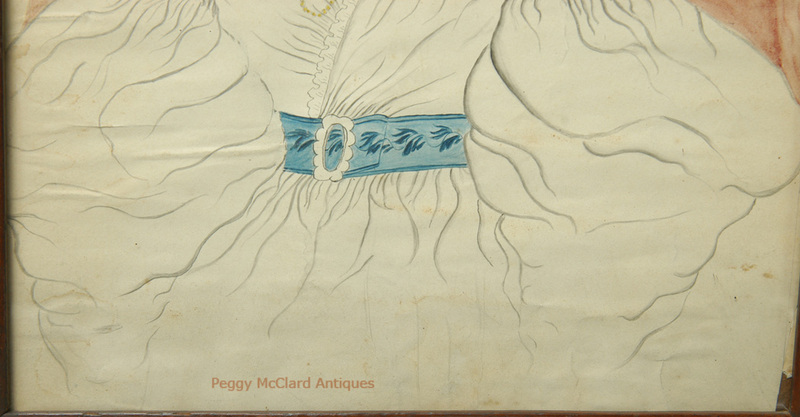 Like so many folk artists of the period, Eastman rarely signed her work. Her paintings are attributed based on her use of pencil or thin watercolor to draw the outlines of her subjects which she then filled with washes of rich color. Precise lines form delicately and highly arched eyebrows, small bowed mouths, the outline of noses and tight hair curls. Eastman used sophisticated poses with bodies and heads slightly turned for an elegant effect. 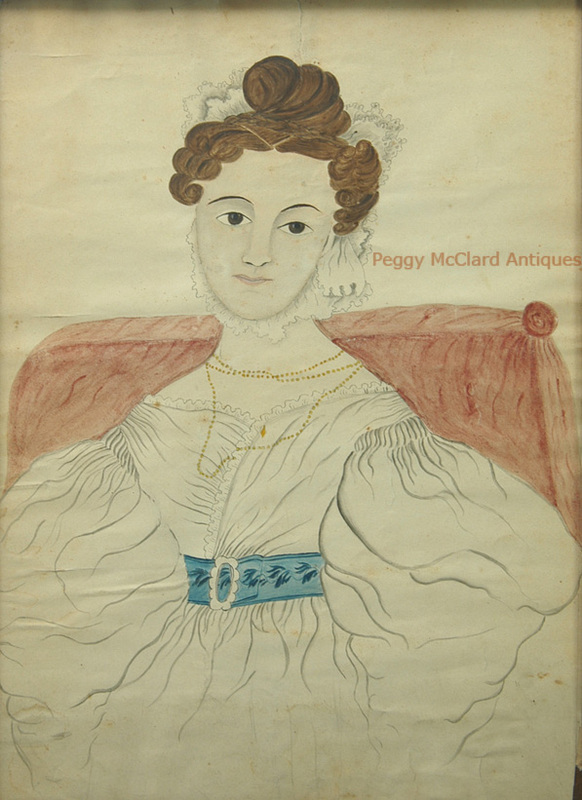 Her work is stylized, simple, highly decorative and shows a repetitive use of poses, formats, styles of dress, hair and facial features: all hallmarks of American folk art in which these repetitive or formulistic portraits were desirable and represented the sitters' social and economic standing. 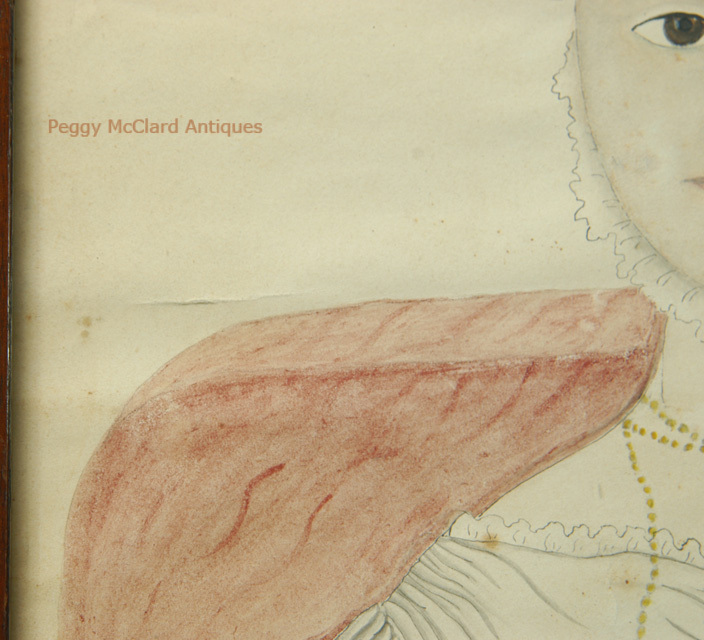 The ladies portrayed are, by all appearances, wealthy and would have had a strong social standing in their communities. There is one known portrait of a child attributed to Eastman. All other known pieces are of young women. Emily Eastman was born in 1804 in Louden, New Hampshire. She married Dr. Daniel Baker in 1824. 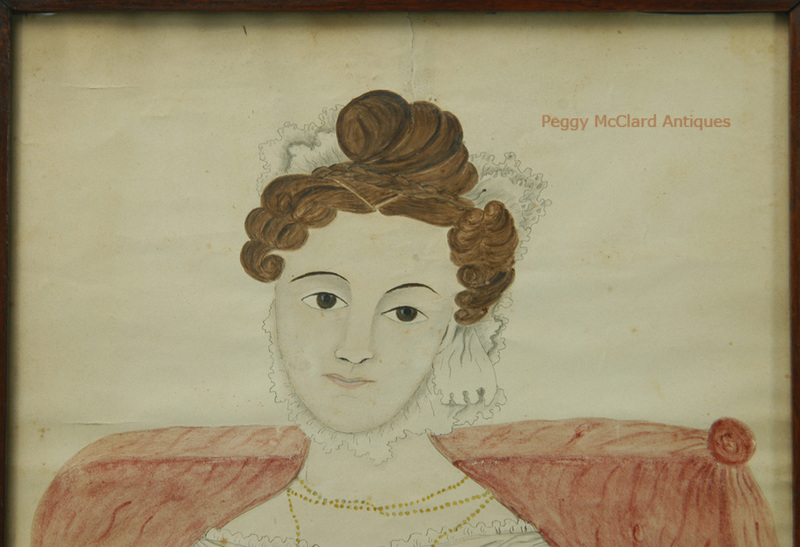 She was actively painting during the 1820s and 1830s. Virtually nothing else is currently known about her life. Eastman’s work is included in collections of great museums across the country. See the references section below for links to works in some of these great museums as well as the museum biographies on Eastman. 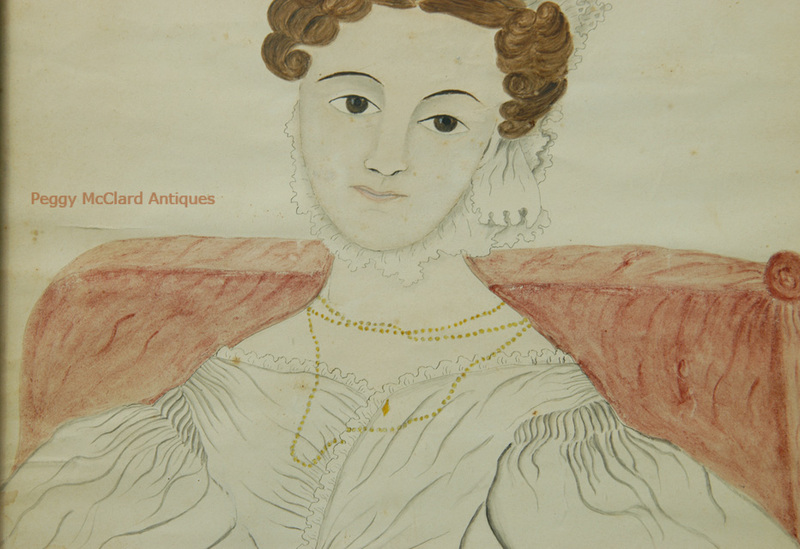 This sensitive portrait of a lady in white with gold necklace is attributed to Emily Eastman. The young lady gazes at the viewer with large brown eyes set under Eastman’s hallmark sharply delineated, arched eyebrows. The lady’s reddish brown hair is elaborately styled with a sharp double part leading to her high top knot that is surrounded by plaited hair. Tight curls frame each side of her face. She wears a lace bonnet on the back of her head that wraps under her chin and is tied above her proper left ear. Her delicate mouth is colored a pale pink. 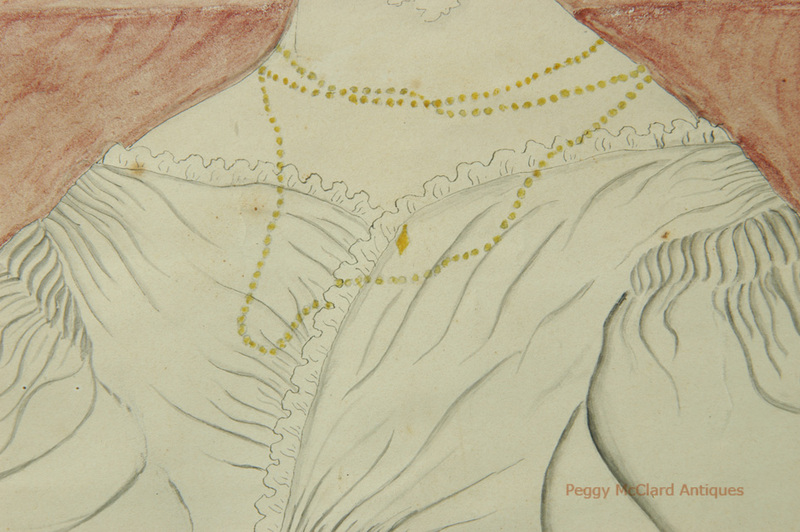 Her gold beaded necklace is wrapped into three strands around her neck and lays upon her draped bodice with cross-over folds (en grebe). Her sleeves are huge, padded in leg-o-mutton (gigot) style. Her blue patterned belt emphasizes her tiny waist. She rests upon an upholstered chair or small settee. 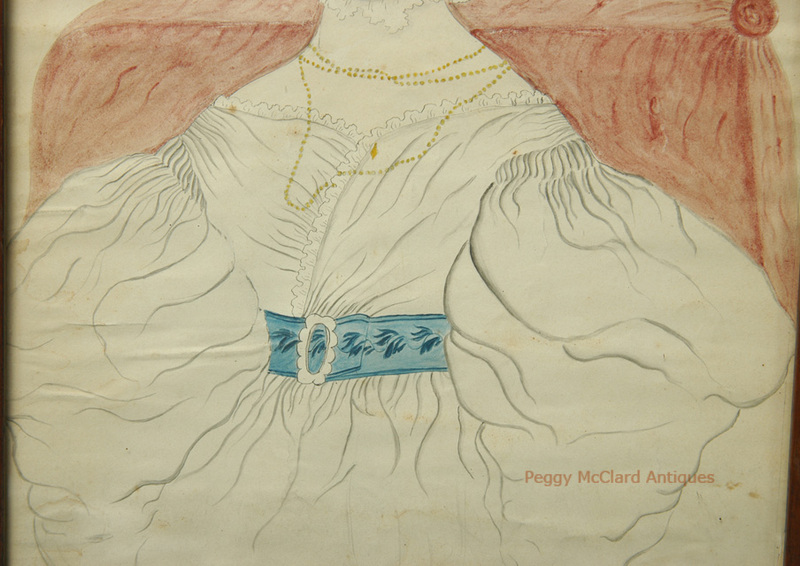 The lady in white is painted on wove paper with watercolor and gold foil accents. 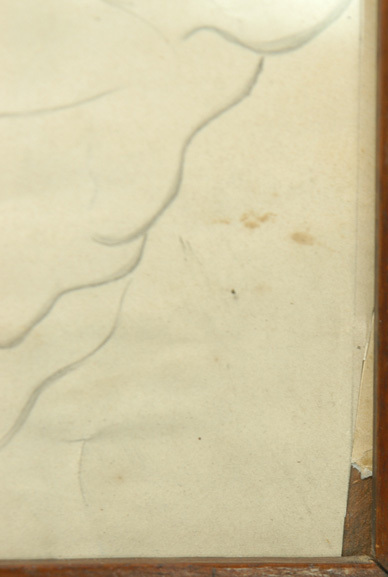 There is a tiny bit of paper loss at the lower right corner, a tight tear at the upper center edge, some slight creasing and waviness to the bottom half of the paper. There is also light, unobtrusive staining scattered throughout. 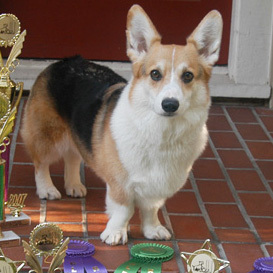 None of the apologies are noticeable without close inspection. Small apologies for a stunning American folk portrait by such a desirable artist. 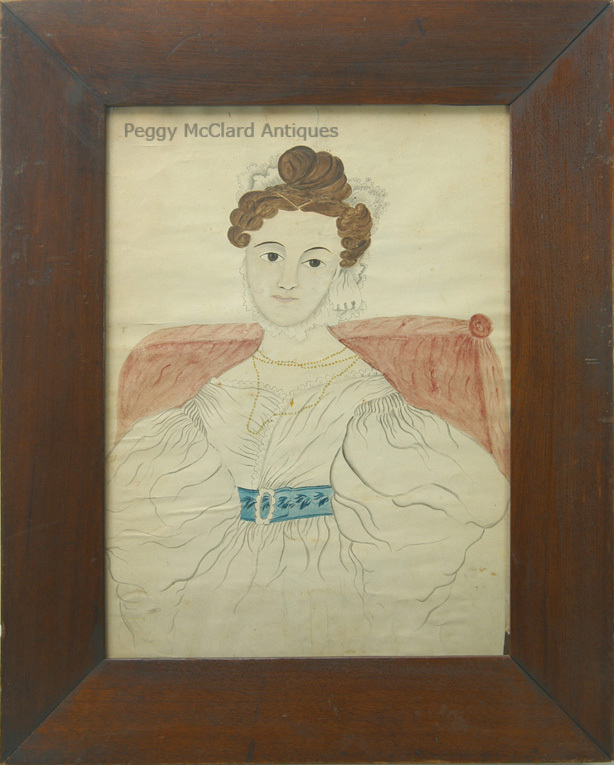 The lady resides in a period mitered mahogany frame that measures 18 ½” x 15”. Sight size is 14” x 10 ½”. Offered at a very reasonable price! Circa 1820. A great addition to your folk art collection. 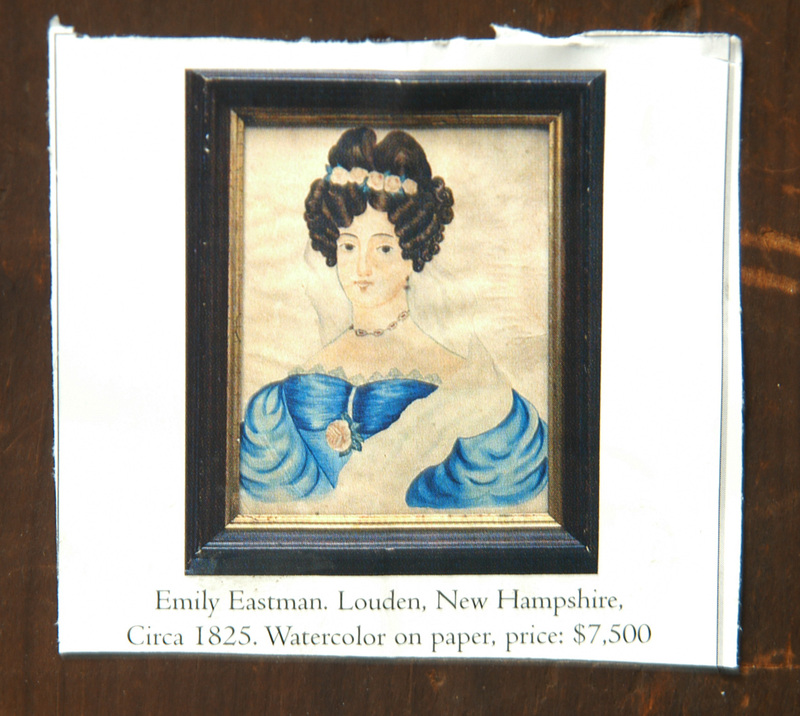 Please see the Folk Portrait Artists page for more information about Emily Eastman. Woman in Veil This portrait was a promised gift of Ralph Esermian. Because of his legal difficulties, I’m not sure whether the painting is still part of the museum collection, but an image is available at the link.